A delightfully uplifting and joyous little book, with lots of feel-good stories about how miracles (or as some like to call them, coincidences) happened in people's lives. Strangers out of nowhere appearing in the nick of time, children helping other kids, friends from the past pitching up just at the right time, old friends strangely reunited, and so much more. Some of the stories will bring tears to your eyes. Because one hears so much bad news every day, it's a wonderful pleasure to come across so many inspirational occurences in everyday lives across the country. Sometimes, in the midst of deep sadness, the beginnings of something miraculous is taking place, the "miracle" showing itself unexpectedly much later, giving one cause to utter an "aha!" Even when things seem so dire and there's no way out, there often is a way out which is totally beyond our control. And that's why it's so bewildering - ultimately, we're not in control. Visit Karen Kingsbury at her website at www.KarenKingsbury.com. You can also e-mail your miracle story to her at: rtnbykk@aol.com. Conclusion - Great for boosting yourself when you're full of self-pity or feeling down. "This review is a wonderful look at my latest collection of miracles. 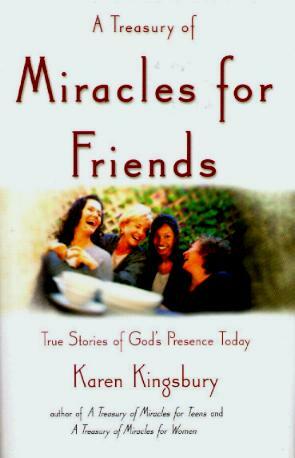 God is still working miracles among us today," Karen Kingsbury says about her Treasury of Miracles. "Our job is to spend a little more time looking for them."